ABSOLUTELY COMPLETELY PSYCHED OUT BY THIS. But as I was browsing my local drugstore today the clearance bin had a bottle of this lovely peach/pink polish and of course I can really never have too many of that colour. At 2.99CAD it went right into the basket, not to mention I as interested to try Revlon polish for the first time. To date, though I am not a huge nail polish junkie, my favourite brand would be OPI. BUT I must confess that this scented polish deal really blew my mind. According to the package, its supposed to be scented after it dries. When you are putting it on, it reeks of that awefull normal polish smell...in fact I didn't think about it at all after I put it on. But as I was doing my work I caught a whiff of a sweet candy smell. Suddenly I realized it was the NAIL POLISH! HOLLY MUFFINS! There was absolutely no residual nail polish chemical scent but only a soft candy scent. Not quite Peach Smoothie but good enough for me! 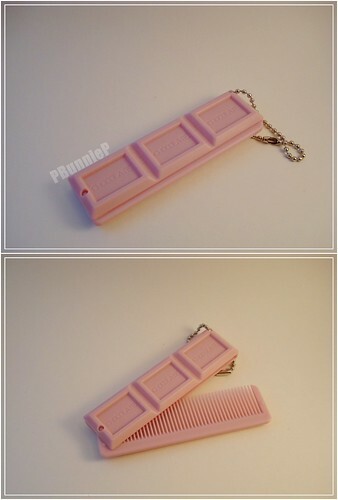 As a comb it is really just average but I just love how people think you are a nut when you pull out what looks like a piece of chocolate. hahahha! On another note, at Daiso I was also lucky enough to come across an egg roll pan. 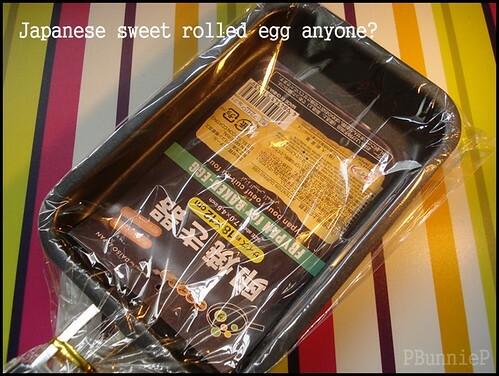 From the cook books I've read, the sweet rolled egg has to be made in a rectangular pan so you can roll it and it will come out in a rectangular block. Ahhhh by now you must be eager to find out about this PURPLE SHAMPOO BUSINESS. The simple answer is really only 2 words. Well that wasn't quite 2 words. I had been eyeing this line since the day it came out. While I dont have blonde hair, I do have coloured/bleached hair which tends to get brassy/orangey. 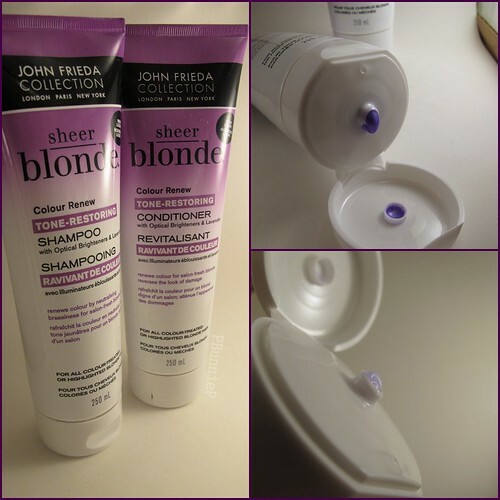 The idea is that purple colour will cancel out this orange tone and make your hair well...more blonde. This duo is definitely serious about their claim...I mean check out that PURPLE shade in the shampoo?!?! While you can sometimes purchase colour correcting/enhancing shades from salon brands, it is rare to find a drugstore option. Hopefully it will do its magic!